Since the start of the new century the world at large has experienced escalating uncertainty as a result of climate changes, epidemics, terrorist threats and an increasing amount of economic upheaval. These uncertainties create risks for the proper functioning of supply chains. This chapter provides an insight into developing a proactive approach to predict risks and manage uncertainties that may potentially disrupt the supply chain. The aim of the chapter is to present a holistic perspective regarding supply chain risk management and incorporate a methodology to manage supply chain risks proactively. When discussing supply chain risk issues with industry personnel it was noticed that post 9/11, the issue of supply disruption had gained importance within the industry. But the focus on managing these disruptions and sources of these disruptions has been primarily reactive. Supply chain personnel in some instances have remarked that they have in the past researched and presented to their top management proactive risk management solutions which had been subsequently rejected and no investment provided. There is now, however, an increasing interest regarding proactive tools and hence this chapter seeks to present a framework for implementing proactive risk management. 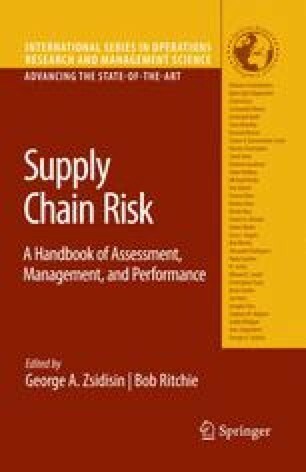 The chapter also suggests some tools which may prove useful in predicting supply chain risks. Media, January 30, viewed 14 September 2007, http://www.manufacturing.net/articleaspx?id=138176&terms=coping%20with%20disaster. Lövkvist-Andersen, A., Olsson, R., Ritchey, T. and Maria Stenström, M. (2004) Developing a Generic Design Basis (GDB) Model for Extraordinary Societal Events using Computer-Aided Morphological Analysis, presented in SRA (Society for Risk Analysis) Conference in Paris 15-17 November, available from http://www.swemorph.com.